Universal mounting holes prepunched 7/16"
A Type 3 barrier is one of the most popular products for temporary traffic control. 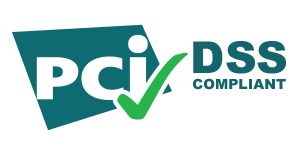 It can be used to effectively delineate hazards or hazardous sites such as roadside construction, alert and guide motorists and protect workers and pedestrians. 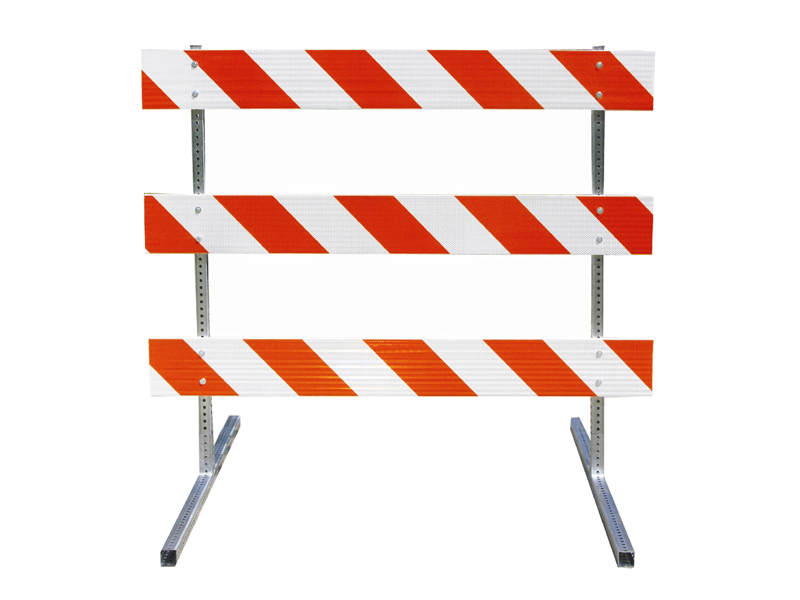 Type 3 traffic barriers can be used to block off road access on highways and other roads during construction. 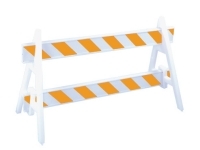 These are essentially large, durable and highly visible traffic barriers which are useful for grabbing the attention of drivers and warning motorists to proceed with caution through a specific area. 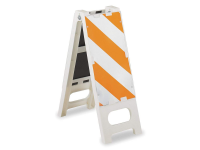 These feature three boards and reflective sheeting with alternating white and orange stripes for added visibility. Typically, they are at least 4 ft wide or larger and are commonly placed near detours, road closures and other kinds of traffic control. 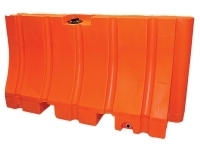 Type 3 traffic barriers come with extruded plastic board and feature plastic rails, plastic legs or steel uprights. The plastic boards last longer in the sun and tough weather conditions as opposed to traditional plywood boards. These are also available in 4′, 6′, 8′, 10′, 12′ lengths. The unique base design also allows these barriers to be placed for short term or for permanently securing an area. 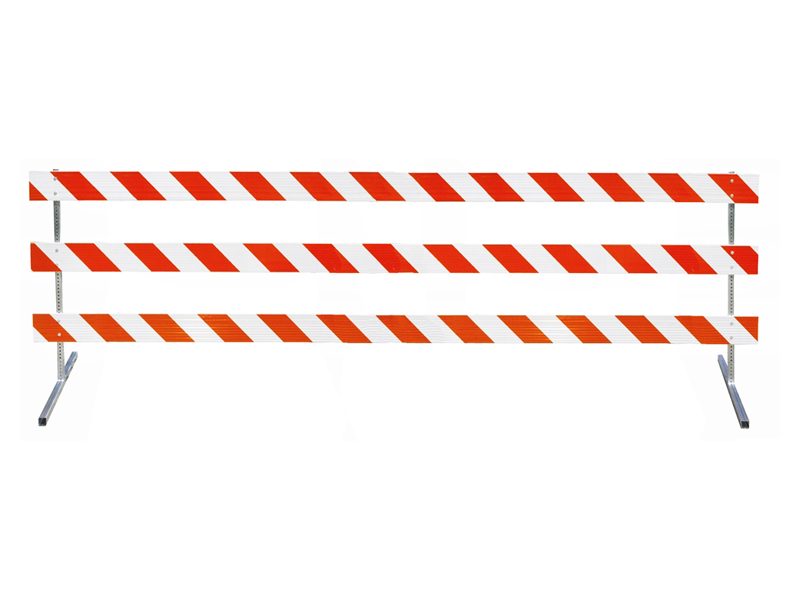 Type 3 barriers can be joined with others in a series to form an impassable line where needed – e.g. 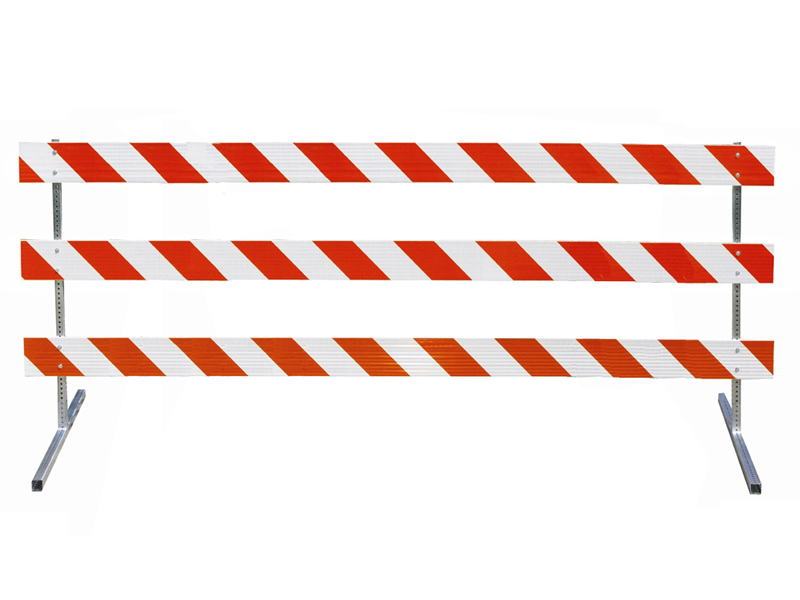 multiple barriers can be placed to completely block off access to a specific road with ongoing roadwork. 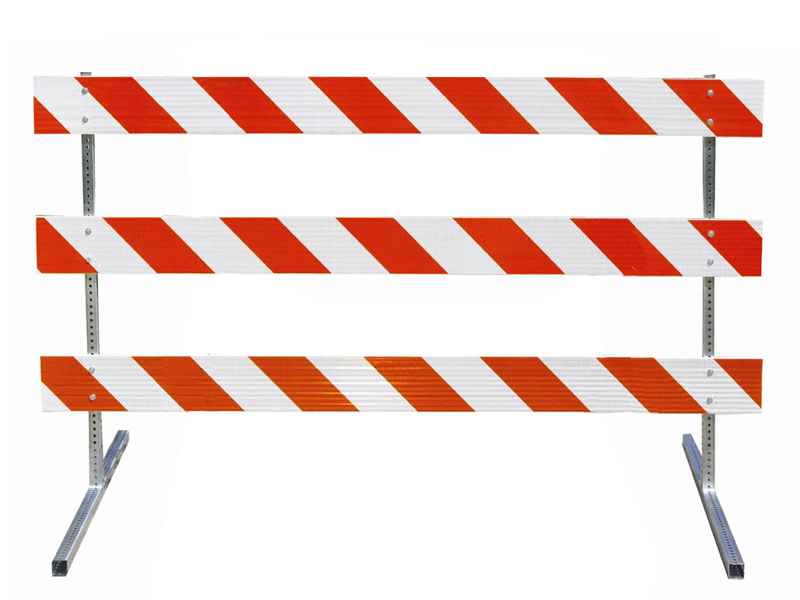 These barriers can also accept two flashing barricade lights for increased visibility during nighttime or in low light conditions. Generally, the warning light should either be mounted above or towards the end of the barrier which is the closest to traffic. The T-boards feature 6″ wide reflective sheeting in two different options – Engineer Grade Sheeting and Hi-Intensity Sheeting. The boards can also be fitted with sheeting on one side or both sides according to your needs and specifications. The retro reflective sheeting is usually waterproof and resistant to peeling, fading or other such damage. 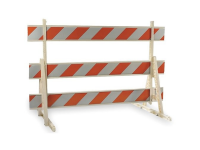 In compliance with federal guidelines, type 3 traffic barriers also feature white and orange stripes which slope downwards at 45 degrees towards the side on which the traffic should pass. Type 3 traffic barriers can also be mounted with traffic signs used to warn motorists of road closures and end of road. 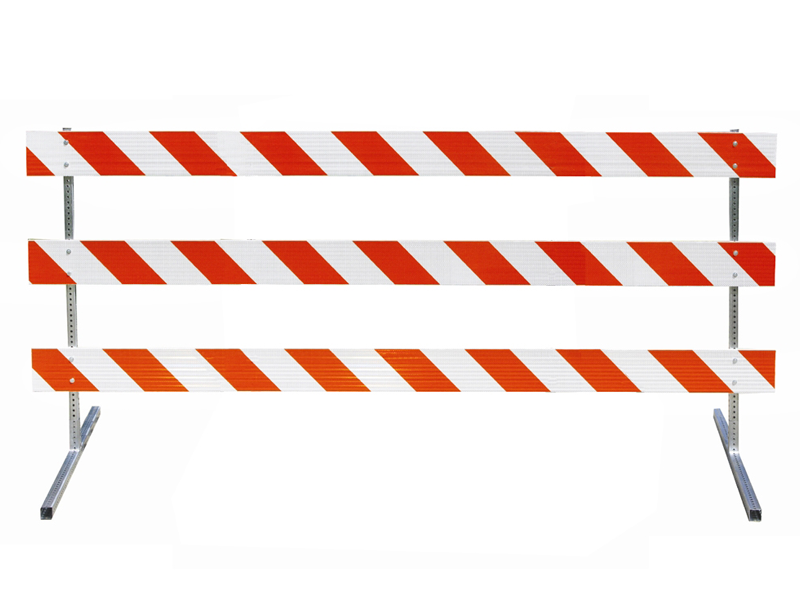 However, it is important to remember that signs mounted on these barriers should not cover 33 percent of the total area of all three rails or 50 percent of the top rails. However, please note that type 3 traffic barriers used to block all access to roads should be placed curb to curb or completely across the roadway.